March | 2010 | The Southern Home Bestuary: Living with our critter friends and enimies. 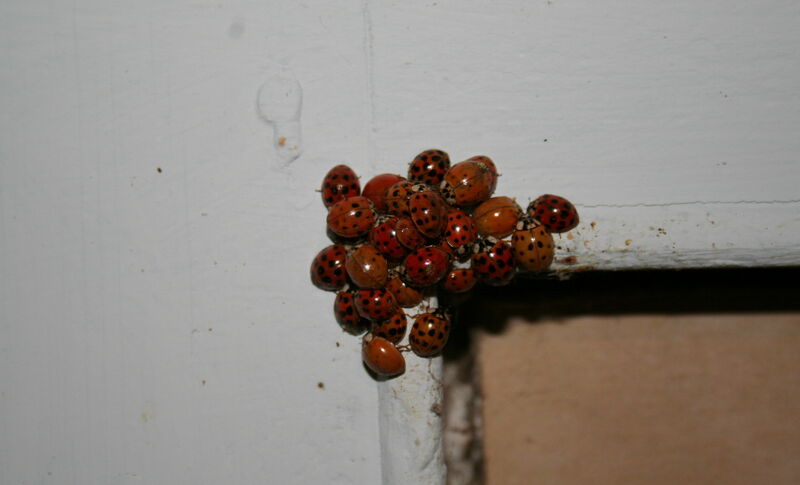 Coming in through any opening these Lady Bug-like bettles overwinter in houses throughout the South. With a range that has expanded throughout the Southern States from Georgia to Oklahoma, the Formosan beetle, a Lady Bug look-alike, has been relentlessly invading homes in rural and forested areas. These beetles move inside with us, like wasp, and overwinter in clusters. They are most visible in the Fall when they come in and in the Spring when attempt to find their way out. Unlike the domestic Lady Bug, these beetles bite. They are not aggressive, but if handled (or rolled over on in bed) they will take a pinch. The bites are not dangerous, and I have never known one to draw blood; although I suppose that this could happen with individuals who are on blood thinners. Control measures are primarily exclusion by calking up holes around windows and doors and by relentlessly vacuuming them up when they come inside. You will never get them all, but you can temporally reduce their numbers. If you crush them they will stink and this smell may linger for days. While perhaps satisfying to stomp a few, vacuuming is the best method. These bugs do have helpful biological function in that they feed on plant pests, like aphids. These invasive insects are now part of America’s permanent insect population, wanted or not. As creatures they are somewhat interesting in that each one has a unique arrangement of spots and a slightly different color. Most of us would think better of them if they were not so “friendly” and stayed outdoors.